SRI engagement and monitoring was a major theme during my first day at the 28th Annual SRI Conference this year (#AllinForImpact), although my 1st impressions were interrupted by the issuance of SEC SLB 14I, as previously noted. SRI has grown more than 13% a year since 1995 (when I started this blog) and now total over $8.7 trillion in assets. No longer just focused on screening or even ESG, SRI has become a mainstream investment strategy AND it holds the power to address our most pressing societal challenges in a way the public sector simply cannot. As a government employee, heading legislation and regulations, I couldn’t protect the environment as a regulator because industry dominated (and that was in California). Even while still on the job, I started switching my emphasis to corporate governance. Since those days, I have been working with many on SRI engagement and monitoring from within corporations as shareholders. A good way to get a feel for the excitement of the 28th conference is to listen to Steve Schueth of First Affirmative Financial. This was supposedly his last year of hosting the conference. “After 28 years of being on the ‘bleeding edge,’ socially responsible investing is ready to make the leap to the mainstream.” View his interview with Investment News: What are the most exciting SRI innovations? He leaves the Conference in great shape for the future. But wait; here he is listed at the top of organizers of the 29th Annual Conference, to be held next year in Colorado Springs. Stay tuned. The world of impact investing has changed significantly in recent years. Internationally recognized thought leader, Jed Emerson discussed how impact investing can stay true to its roots, and develop and expand its focus while continuing to influence mainstream investing. In many of our field’s recent discussions, we have come to focus too much on impact investing as a means of creating some new form of financial investing as opposed to its promise as a vehicle for advancing economic performance together with social change and real environmental sustainability. From my own, personal perspective, The Purpose of Capital is to be applied as a fuel for freedom—to fund disruption of the social and economic status quo—to be a tool of resistance; otherwise, it is simply capital as economics and traditional finance. SRI engagement monitoring is about more that ensuring against the misappropriation of our work. Capital must create meaningful, sustained impact. The Purpose of Capital is not simply the absence of evil – but the active pursuit of healing, wholeness and love in this world. While his address to 28th Annual SRI Conference involved more discussion of physics and other references, many points were similar to his keynote to the SOCAP community. Companies are setting aggressive energy efficiency, renewable energy, and greenhouse gas reduction goals, in part because they are being pushed to do so by investors through SRI engagement efforts. There was a lot of discussion by various panelists about the breakthrough first-time approval of climate risk proposals at Exxon (XOM) and Occidental (OXY) represents a huge win. Victory was only possible because of a highly visible shift in voting by mainstream funds State Street, J.P. Morgan, as well as from BlackRock and Vanguard, which joined climate risk proponents for the first time. However, do not get complacent. More effort to get mutual funds to address climate change is still needed. According to the 50/50 Climate Project representatives at CII, Vanguard backed only 15% of such proposals, while Blackrock voted for only 9% — despite both managers’ high-profile support of resolutions at ExxonMobil and Occidental. The cynic in me says votes may be more driven by the potential for adverse publicity, rather than potential impact on value, although the two are undoubtedly correlated. See Vanguard’s Investment Stewardship 2017 Annual Report. SRI engagement with company management teams on material ESG issues has become more critical than ever. Calvert did a good job of outlining their goals and approach. Like index and public pensions, Calvert views themselves as permanent owners. Much of their impact comes through engaging. Their initiatives mostly focus on transparency and disclosure. Generally, they start to dialogue with companies before filing proposals. They filed about 30 proposals last year. One prominent vote was about 40% on a sustainability report at Nucor. Looking up the votes at Proxy Insight, I see Vanguard and BlackRock did not support but State Street and several other large did. Calvert is engaging with food and agricultural companies on clean water issues, asking them to measure impacts and risks from their own operations and through their supply chain. They are also focused on board diversity issues, having filed 80 diversity proposals over the years. Human rights efforts at Nike and Gap; PRI supply chains; corporate human rights benchmarks were also discussed. The pioneering work of the Global Impact Investing Network (GIIN) has pushed the envelope, calling on investors to develop and report concrete impact metrics, going well beyond monitoring risks such as simple carbon exposure. Investors are now measuring environment and resource efficiency. GIIN members are identifying companies that are solution drivers. Net carbon avoidance, generation of renewable energy, recycling, water reuse, and more are in focus. News. On September 25th 2015, countries adopted a set of goals to end poverty, protect the planet and ensure prosperity for all as part of a new sustainable development agenda. Each goal has specific targets to be achieved over the next 15 years. Sustainable Development Goals (SDGs) provide humanity with a universal framework within which every company and every domain of impact finance and innovation can align the capital, the efforts, and the energy necessary to create a truly sustainable future. Amber Nystrom discussed how investment advisors are finding that SDGs are good for communicating to clients. Women and millennials are firing old wave advisors and resonate with SDG reporting. Sergio Fernandez de Cordova is using media and technology to drive SRI engagement and change. Public/private partnerships have been helpful. How do we engage everyone? Track data tools. He described a survey they sent to 70,000 leaders that got 165,000 responses. Many sent the survey on to others, mostly in Africa and Latin America. Read about the Media for Social Impact SDG Gender Equality Award. Priya Mathur described how CalPERS is integrating SDGs into proxy voting and investing. SRI engagement is increasingly focused on impact and creating a better world for all. Mathur Chairs SDG advisory committee for PRI, mapping all current practices to SDGs. They are looking to engage 100 companies around greenhouse gases. Before the ice cream social that ended the evening, we had a brief inspirational talk from astronaut/author Ron Garlan. Part of a select group of individuals who have been fortunate enough to see the world from space, Ron founded the initiative Fragile Oasis, championing The Orbital Perspective message to improve life on earth. Yes, he showed us photos, including the iconic god’s eye view of earthrise. I was even more impressed by photos such as the one below showing how fragile earth’s atmosphere appears from space. 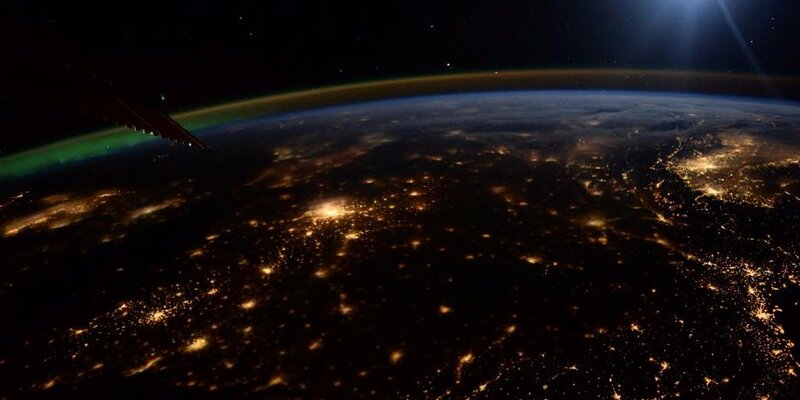 Our own lights look more powerful than the thin layers of air that allow life on earth to thrive.